Follow the members of lP-Trek as they explore the wonders along the Silk Road and Fan Mountains of Central Asia. lP-Trek is a world-wide network of more than 60 Intellectual Property (IP) law professionals, from 21 different countries, who are committed to fitness through regular outdoor activity, and who gather every second year to participate in a major open-air trekking experience in one of the earth’s great wild areas. In 2007 IP Trek climbed Kilimanjaro with Berg Adventures, for their 2009 adventure they are bound for Central Asia. On this trek we will follow the footsteps of Marco Polo who explored Uzbekistan in the 13th century and uncovered many mysteries of an unknown land. 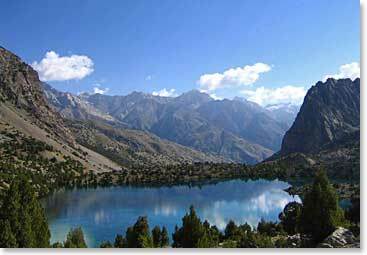 We will then take an exceptional trek in the Fan Mountains of Tajikistan where we will find ourselves immersed in beautiful alpine landscapes. We cross challenging passes, strengthen our legs on steep mountain trails and our spirits with breath taking mountain scenery. Stays tuned to our daily dispatches and get a first-hand experience of this unforgettable adventure. August 7, 2009 – Crossing the Twin Laudan Passes to Hot Showers!